(June 02, 2007) There is no doubt the Internet is revolutionizing information delivery to a worldwide audience. This audience is growing at a double-digit rate as only two years ago, according to Internet World Stats, in June 2005 there were 938 million users. Last year there were 1,043 million users and as of today a staggering 1,133 million people access the Internet! Without a doubt the Internet is now the world's largest storage of knowledge and data. Consumers use this information to read about the latest technology, compare and buy products they desire. To view all this information one needs to use an Internet Web site browser. 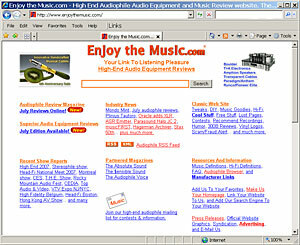 As a longtime and highly respected Internet Web site for audiophiles, Enjoy the Music.com began offering the world's first Web browser for audiophiles back in May of 1999. With over seven years of experience in Web browser development and research, Version 9.1 refines and streamlines our previous efforts with links to online equipment reviews, music reviews and many highly respected magazines. We also offer links to equipment manufacturers from all around the world. An additional feature to aid audiophiles includes a Search box customized to deliver query results specifically geared towards high-end audio topics. Optional components for multimedia enjoyment such as the Microsoft� Media Player, iTunes, YouTube, Rhapsody and others works seamlessly in concert with the browser to deliver Internet-based audio and video entertainment. Improvements to our previous version marks the availability and support of over 20 languages including French, Italian, Spanish, Chinese (simplified and tradition), Japanese, and German. Enjoy the Music.com has been the Web�s leading information Web Site for audiophile music and equipment consumers since 1995. Over the years we have received critical acclaim from Web surfers and audio publications both on the Internet and in print. Being affiliated with three prominent print publications while also offering its own Review Magazine, Superior Audio and Classic sites -- with 100 show reports online to date -- Enjoy the Music.com has become the leading Internet authority for diverse information serving both audiophiles and music lovers worldwide. We are the only specialty audio site with its own Web browser so consumers can easily find information they desire and compare competing products. Due to such immense popularity and industry-wide respect, Enjoy the Music.com is official Internet partners with The Absolute Sound, The Audiophile Voice, and The $ensible Sound. Click here to install V9.1 and enjoy many great new audiophile links and benefits.